At a government related celebration, Alia was seen in a black long anarkali by Anita Dongre with silver earrings from Amrapali. She did look pretty but the anarkali felt a wee bit busy. I feel like adding a plain dupatta would’ve downplayed the all over embroidery. 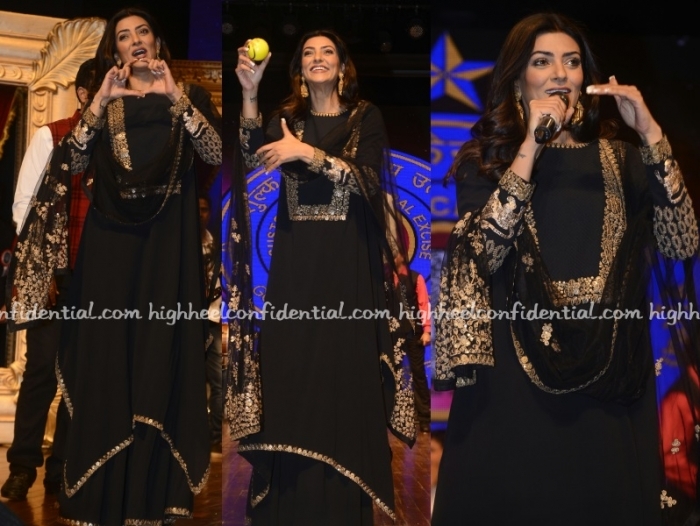 Sticking to her favorite color was Sushmita at the International Customs Day celebrations in Mumbai on Saturday. But, you won’t find us complaining here. Loved seeing her in this Sabyasachi suit. Anushka attended the International Customs Day on Saturday wearing a yellow Anita Dongre anarkali with jewellery from Pink City and gold ankle-strap sandals. Not much to fault here. She looked pretty!